Join the discussion on our forums! 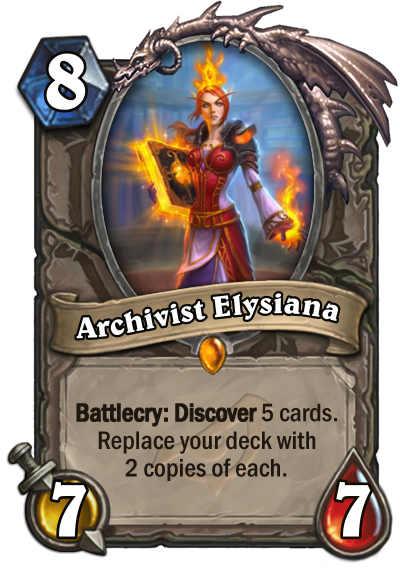 Come discuss Archivist Elysiana over in our dedicated Archivist Elysiana discussion topic. Battlecry: Discover 5 cards. Replace your deck with 2 copies of each. Great card if you survive that far. Sometimes you can get rid of the annoying bombs as well. Good tech card for some mid-range type of decks as well to have a second chance against very slow fatigue decks. In a control warrior mirror match once I managed to discover Chef Nomi with her, and when my deck was gone again that enabled me to win directly. I recently played against a Warlock running this against my Bomb Warrior at Rank 18. It seems like a good way to get rid of bombs in the late game. Unfortunately for said Warlock, he picked Hakkar and The Soularium, which he ended up basically killing himself with after I killed Hakkar. Absolutely Zero Regrets! Crafting This Golden! She's So Good! Bye bombs! Worth noting that you don't get copies of the cards you discover added to your hand, contrary to what I believed. Still a pretty great card though. Running this on my new Control Warr list, and so far so good. We'll see. In that case, you have to play it when you're 1 card left. 0 cards left counts as a "deck" in this case, I guess. It just replaces the state of no cards with state of 10 cards. Favorite card of the expansion without no doubt. Any dedicated control player will love this one. Beatiful art, interesting effect, many possibilities and fun guaranteed. We need more cards like this more often. Cards with these cool effects just like Confessor Paletress, Nexus-Champion Saraad or Elise the Trailblazer. Welcome to the family Elysiana. Should see play in Control decks looking to win fatigue battles. Getting an extra ten cards once your deck is empty seems pretty strong, regardless of those cards' quality. Note, it’s not suffle into your deck, it’s replace your deck. Now you can counter Hakkar, the Soulflayer with any class as it’s a neutral minion. Can help with countering Bomb Warrior too. And this deck seems to be no joke.